P1020191, originally uploaded by michael_jecks. I am sitting down still, trying to finish 29 while the weather outside is so good (David Hewson’s just back from Canada saying he’s found the summer’s returned), and all I really want to do is get outside with a tent and sleeping bag and walk some of the longer paths over the moors. This one, courtesy of my brother Keith, was taken in August when we undertook our three day march from north-east to south-west. That walk was bloody good fun, especially with views like this, down near Burrator. They say that the early crosses were installed to help people navigate. 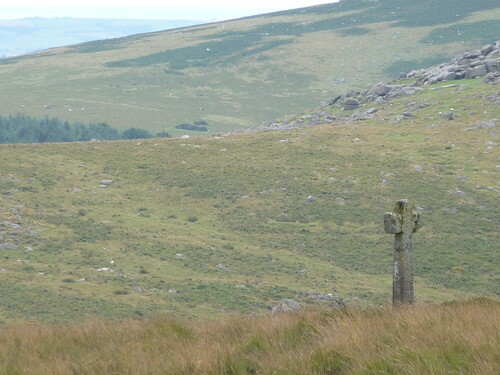 So many used to die trying to cross the moors that it was decided by the monks at the three monasteries to install crosses at specific points, each in view of the next, so that walkers would only have to aim for the next cross to be able to follow the track. However, I’m a little suspicious of that. It is not usually so easy to see from one cross to the next when the weather is bad: if a cloud comes down, visibility is reduced to a few tens of feet, not half a mile or so, which is how widely spaced these crosses could be. So perhaps there was an assumption that a man should know roughly the right direction, would set off, and then hope to come close-ish to the next? Or was it a built-in safety feature, so that if you couldn’t see the next cross, just give up until you could? Anyway, thank God in a few weeks I’ll be out this part of the moor again, wandering all around the southern parts with my brother, and my brand new Alpkit PD600 sleeping bag. Light, tiny, and incredibly warm. I’m very glad with that. So, provided we have enough hot food, smoked meats and other basic supplies, we’ll be having a fantastic five day walk in the middle of November. And as soon as that’s done, it’ll be time for signings. This entry was posted on Tuesday, October 27th, 2009 at 5:21 pm	and is filed under Dartmoor. You can follow any responses to this entry through the RSS 2.0 feed. Both comments and pings are currently closed.